When you bought your pressure washing machine you may have never thought that there are plenty of options that are opening for you. You can do a lot with your machine if you have the right accessories. These will make your work very effective and time-saving in this busy world when you hardly have time to spend on your cleaning. Pressure washer surface cleaner is such an accessory that is a perfect tool for cleaning your concrete, wooden, tile, etc. surfaces. It is mostly round shaped tool with multiple nozzles fit inside it to spray water. There is another round shaped metal plate attached inside the outer covering. This plate spins with a good speed that adds extra power with the nozzles’ water spray. The experts always prefer a pressure washer surface cleaner when they need to cover a longer area. This tool makes the surface cleaning at least four times faster than the normal spray gun. You can easily clean your patio, driveway, sidewalk, pool, ramps, parking lots, warehouse, and many other surfaces. To clean oil, grease, mold, algae and the other difficult dirt this round shaped tool is very effective. 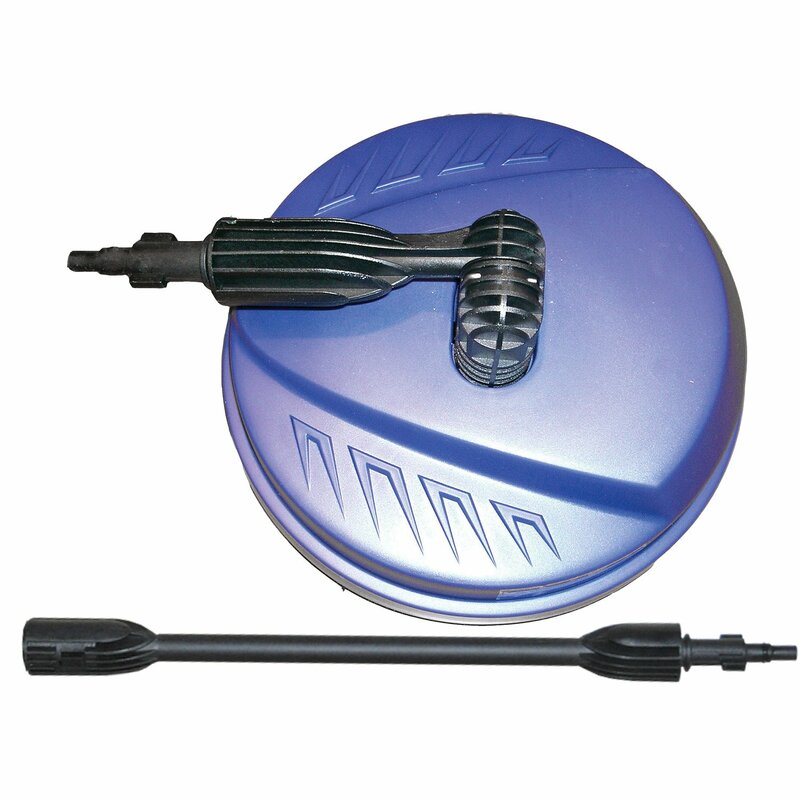 You can easily use this accessory with both your hot water and cold water pressure washer. Before buying this part you just have to make sure that you are buying the best pressure washer surface cleaner. We strongly recommend you to buy this accessory if you have a large surface to clean regularly. 1.1 Why do You Need a Surface Cleaner? 3.0.1 What should be the right size? 3.0.2 With wheels or without wheels? 4.1 How does a Pressure Washer Surface Cleaner Work? 4.2 How to Use a Surface Cleaner? Why do You Need a Surface Cleaner? This is a common question that comes to most of the pressure washer users’ mind, why should they buy a surface cleaner when they already have the spray nozzle. This question is appropriate to a certain extent. But, when you think about cleaning a wide space it needs a lot of your time and effort to get a good cleaning. A surface cleaner removes the dirt four times faster than a normal spray gun. You will not only save your time but also you will get an effective cleaning. When you clean a surface the water gets scattered after hitting the surface which makes the surrounding place wet. The surface cleaner prevents the water from getting scattered and keeps the other stuffs dry. This is an excellent surface cleaner that makes your cleaning quicker and faster with its six nozzle spray. You will get a perfect cleaning with this machine. In general, we see that a surface cleaner contains two nozzles and PowerFit PF31023B Surface Cleaner is an exception. To clean the mold, algae, rust, oil or grease, etc. you will love to use this accessory. Check More Photos on Amazon! Features: The features this tool has got are stated below. The weight of this tool is 4.35 pounds. Attractive Sides: There are many good sides of this tool. It is ideal for patio, sidewalk, garage and other rough surfaces. To clean your rough surface quickly and smartly you can easily depend on this tool. You don’t have to worry about its durability as it lasts for many years. Instead of roaming around the market buying this tool will be a wise decision. This is another finest quality surface cleaner that helps you clean your driveway, patio, rooftop, balcony, and many other flat surfaces. It increases its cleaning speed with its dual high-speed rotating jets. While cleaning it covers a wide area at a time and removes all sorts of dirt and stain. This tool perfectly fits with gas-powered machines but you can easily use it with electric pressure washers as well. 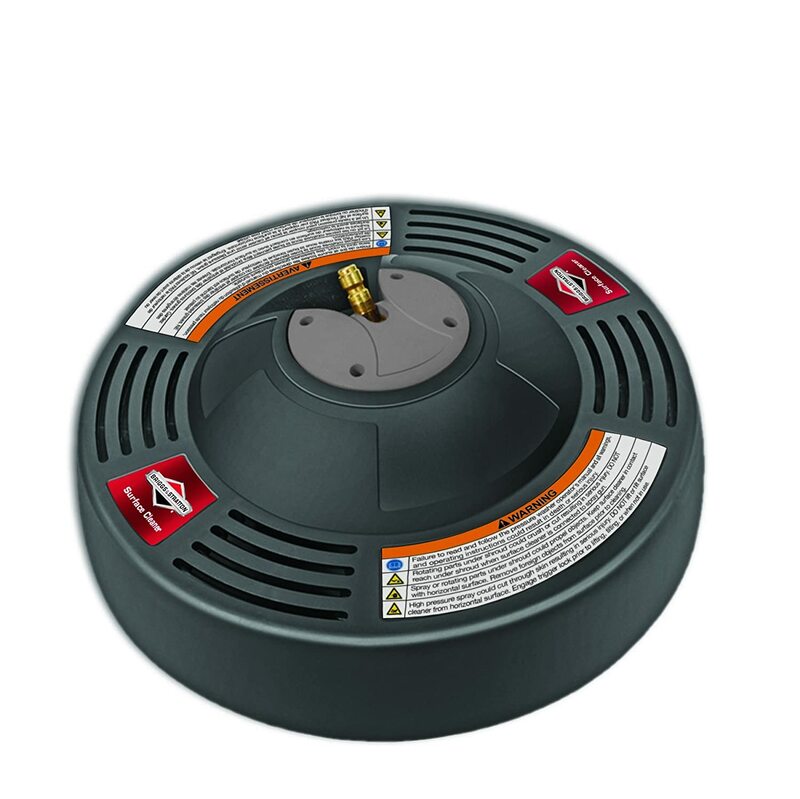 Features: Briggs & Stratton 6328 14-Inch Surface Cleaner has the following features. It has 3.5 pounds of weight. Attractive Sides: The following sides might attract you and help you decide to buy it. 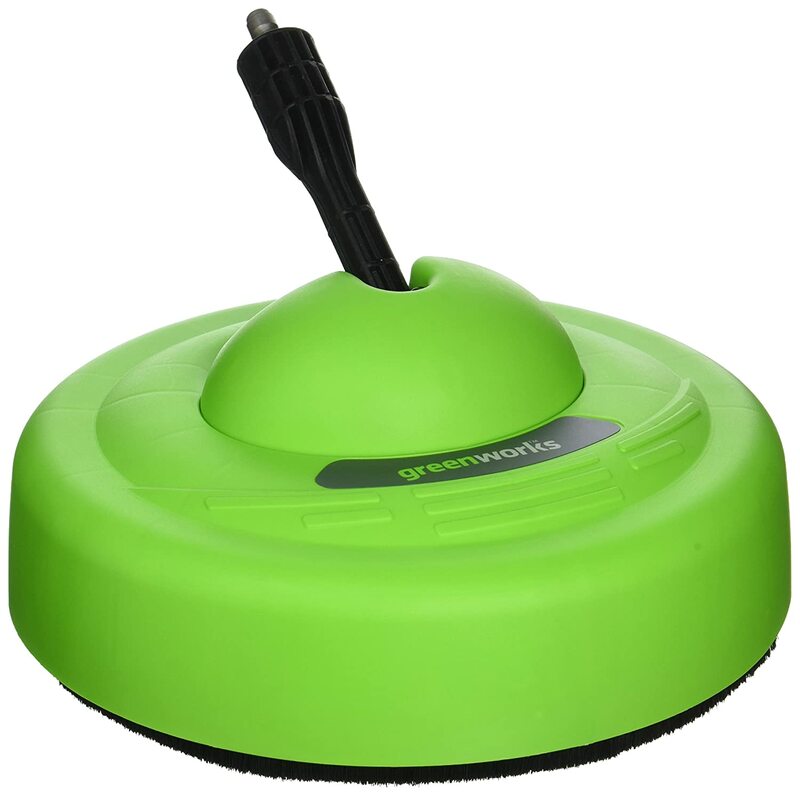 You can choose this surface cleaner as well as it has all the good features and it is lighter. This tool also will last for many years. Many users have been using this accessory for a couple of years without any problem. To clean your floor 4x faster you should choose this surface cleaner as it has all the good features that make it a perfect tool. It is perfectly compatible with a gas-powered machine but you can freely use it with your electric pressure washer. It keeps the nozzle at a fixed height that eliminates the tough dirt quickly. Connecting this tool with your spray gun is easy and the surface cleaner provides you with a free movement for proper cleaning. Its weight is 3.8 pounds. Attractive Sides: The below benefits might attract you. Connecting it with your spray gun is really easy. We strongly recommend Karcher 15-Inch Pressure Washer Surface Cleaner if you have a large area to clean. The money you will pay for this tool will provide you the maximum benefit. For technical faults, you can easily contact the authority to solve your problem. It is a universal surface cleaner that easily fits most of the spray guns that are available in the market. It has an extreme tolerance level, 3600 PSI water force. To remove the hard-to-clean dirt you can easily rely on this tool because of its high power. 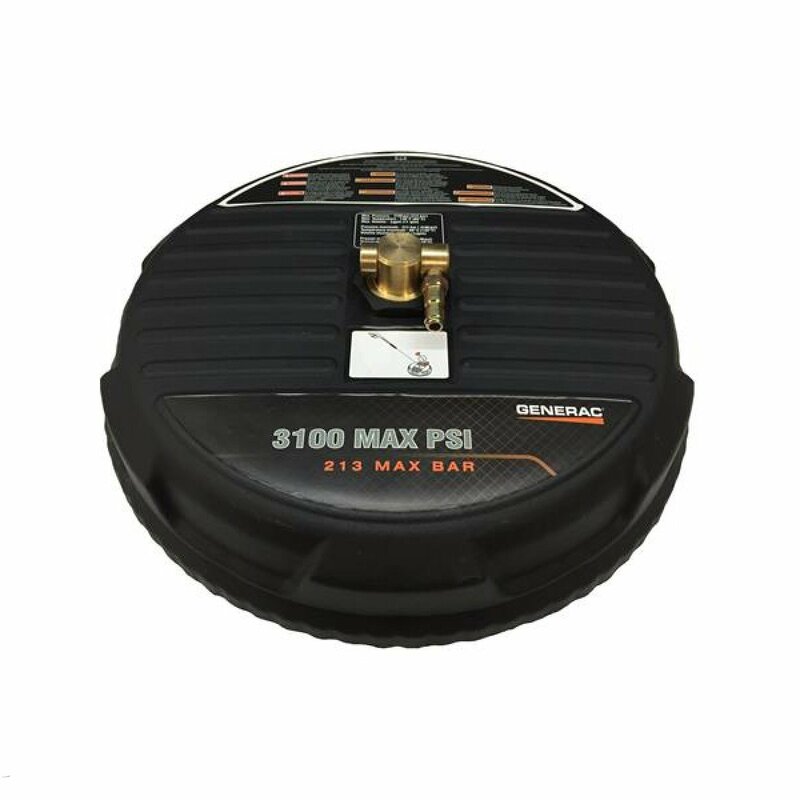 Its 15-inch diameter allows you to clean your patio, driveway, rooftop, garage, room floor and the other flat surfaces within a short period of time. 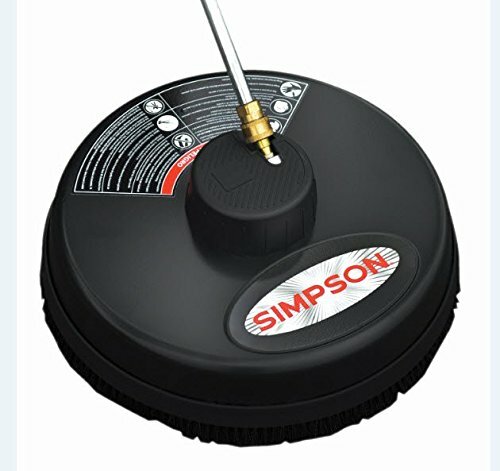 Features: The following features are included with SIMPSON Cleaning 80166 Universal 15-Inch Steel Surface Scrubber. Its diameter is 15 inch. Its weight is 3.5 pounds. 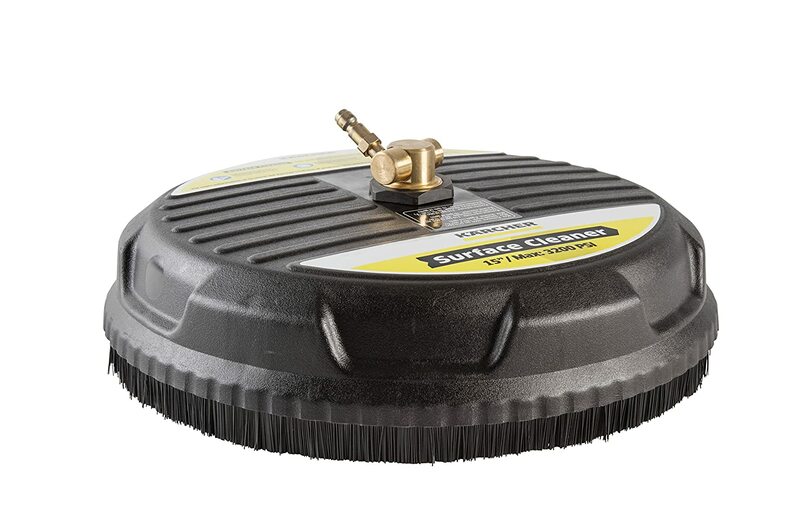 Considering SIMPSON Cleaning 80166 Universal 15-Inch Steel Surface Scrubber’s features and good sides you can easily choose this tool. You will get good benefits and your investment is secure with this tool. Are you bored with the regular color of surface cleaners? Most of the companies make black or matt color tool and the buyers don’t have any choice except selecting these. But Greenworks is not like the other companies. They make products keeping their company name, GREEN in mind. You might be attracted by seeing their environment-friendly colored surface cleaner. It also has many attractive features that will blow your mind. Its weight is 1.8 pounds. Attractive Sides: Let’s have a look at its good sides. You will get product service for free. If you want to buy a cheap and good quality surface cleaner this is one of your best options. You will get almost all the facilities like the expensive ones. The machine is durable so your investment is secure and for any technical problems, the company will provide the solution. To increase your working speed you may use this tool which is very effective. This is one of the cheapest products and it works quite beautifully while cleaning. It has a power control system along with its long wand so that you can cover a large area within a short time. It is compatible with Karcher pressure washers and many others also. To carry it there is a holding bar at the top of its housing. 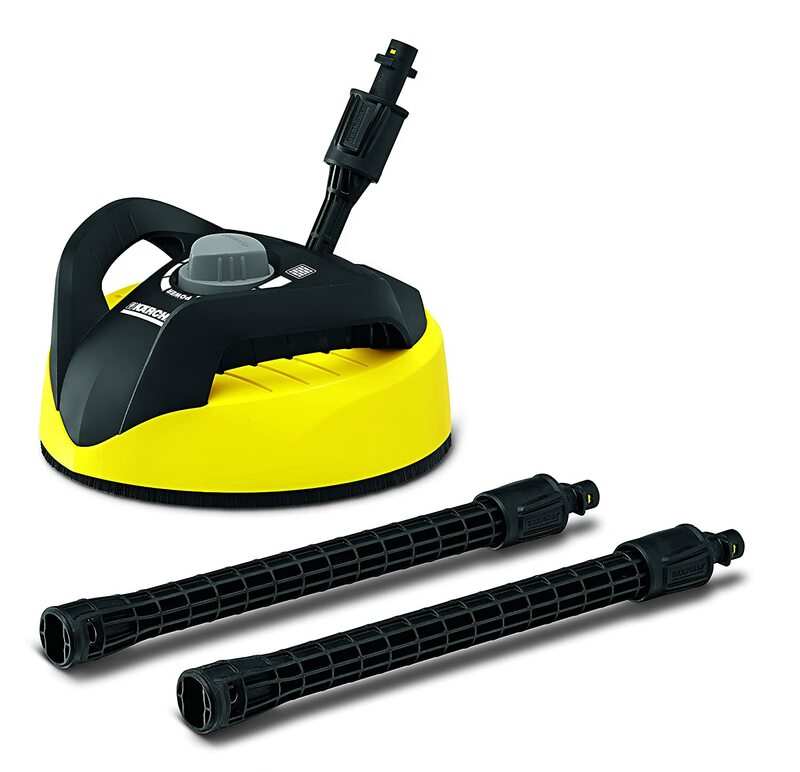 Features: Karcher T300 Hard Surface Cleaner has many attractive features. It has got 4 pounds of weight. Attractive Sides: Let’s look at its beneficial sides. It works perfectly for the flat surfaces. This surface cleaner is really a cute and smart one. Its power control system is unique in that you will find in very rare tools. If you have a Karcher pressure washer this surface cleaner will be perfect for you. This surface cleaner is ideal for driveways, sidewalks and other flat surfaces that get dirty very often. You will get the top level tolerance with this tool as it can be used for the maximum of 3100 PSI water force. Stainless steel and plastic construction of this tool make it a long lasting one with perfect efficiency. It is very easy to connect with your spray wand that saves your valuable time. Features: Generac 6132 High-Pressure Surface Cleaner has got the below-listed features. No one wants to waste his money buying a product that doesn’t last long. Generac 6132 High-Pressure Surface Cleaner is pretty durable and your investment will be safe with your purchase. You can easily clean all your flat surfaces that get dirty very often. Do you want to buy a surface cleaner with wheels? If yes, this product will be perfect for you. It can tolerate quite high water pressure which considers it to be a commercial one. For better maneuverability it has wheels and you can control it by using its comfortable handle. The spray gun is attached with one of its handle that can relax your regular spray gun. For stylistic users, this product is an ideal one. 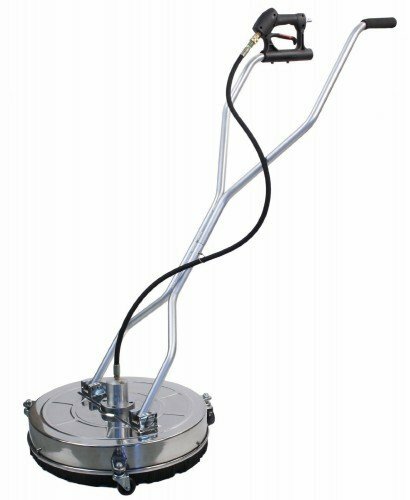 Features: Whirl-a-Way Stainless Steel Pressure Washer 4000 PSI 24″ Surface Cleaner has the following features. Attractive Sides: The amazing qualities of this tool are stated below. For cleaning your patio, driveway, sidewalk and other flat surfaces it is one of the best. To clean a very large area you need an efficient surface cleaner. You can easily use this tool for the residential and commercial purpose for its better tolerance level. The handles are quite comfortable to control the product. If you buy this tool you don’t have to worry for many years. Your thinking of using your surface cleaner for the residential and commercial purpose will be solved by Karcher this product. Its maximum water pressure tolerance level puts it in the commercial group. It has better maneuverability because of its wheels and you can move it easily by using its handle. The spray gun is attached with one of your handles so that spraying becomes comfortable. Features: For your better understanding the features are stated below. Its height is 36 inches. Attractive Sides: You will get the following benefits with your purchase. Karcher is a world-class brand who makes the finest quality products. You don’t have to worry about this product’s performance and your investment will be well secured with your purchase. It will definitely make your work smooth and faster. This is another low budget product that works perfectly for residential cleanings. It cleans 60-80 percent faster than any regular spray nozzle and saves your time and energy. You can use this surface cleaner perfectly with AR Blue Clean pressure washers. To clean your patio, driveway, sidewalk, and many other surfaces you can confidently rely on it. It has an attractive color that makes it an exclusive one. Features: Have a look at this product’s features. Attractive Sides: This product has got the following attractive sides. For medium level residential cleaning work this surface cleaner is an ideal one. You shouldn’t actually go for the high power tools if you don’t need them. It will save your time and money from wastage. You might think that it’s very easy to buy a surface cleaner. You just have to go to the market and buy one. But you should know that it is easy only when you know about it properly. Otherwise, you might end up suffering a lot. The above pressure washer surface cleaner reviews will help you find the best tool. While buying the things the questions that should come to your mind are described below. What should be the right size? You will get different size surface cleaners that have different diameters, starting from small to large. In general, you will get from 12 inches to 36 diameter ones. The 12 and 15 inches surface cleaners are mostly used for the residential purpose as they require less GPM, the rate of water flow. These tools require around 2-3 GPM water flow. For larger sizes, you will need more GPM. With wheels or without wheels? It’s a complicated question that is hard to answer. In short, we can tell that depending on your situation both can be good. Normally the surface cleaners don’t use wheels as they float using the water pressure that comes out through its nozzles. The wheels sometimes make it difficult to control and might trip you up. But, while using a vacuum hose it is easier to control a surface cleaner with wheels. Inside the surface cleaner, the nozzles spin with a good speed. This spinning is created by swivel which should be smooth. You should check the bearings of your swivel that should always be lubricated with oil or grease. You must have a good knowledge about nozzles. The nozzles that are used in your surface cleaner should be strong and durable. The water should pass through these nozzles without making an obstacle. Check all the nozzles carefully before buying your surface cleaner. Semi-Pro Surface cleaner: In general these surface cleaners are comparatively less powerful and are often chosen for residential usage. These tools are less expensive too and for that, they are affordable for most of the people. If you don’t have a very wide space to clean this surface cleaner will be best for you. 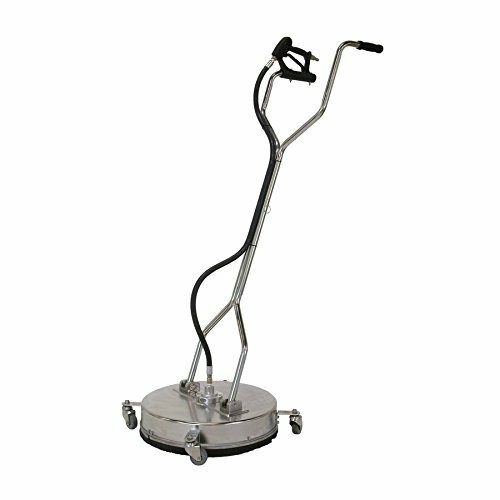 Professional Surface Cleaner: For working in office, factory, large marketplace where the area is quite large that need to be cleaned, you need a professional surface cleaner. These places get dirty very often and they always get tough dirt that is hard to clean. Professional surface cleaners are comparatively powerful and can be used with powerful machines. How does a Pressure Washer Surface Cleaner Work? A surface cleaner uses two or more powerful spray nozzles that are attached with a spinning swivel. There is a cover which is called ‘housing’. It is mostly made of strong plastic or metal to tolerate the high-pressure water flow. When water comes through the two nozzles the swivel starts spinning with a good speed. The spinning force and the nozzle pressure increases the work effectiveness. 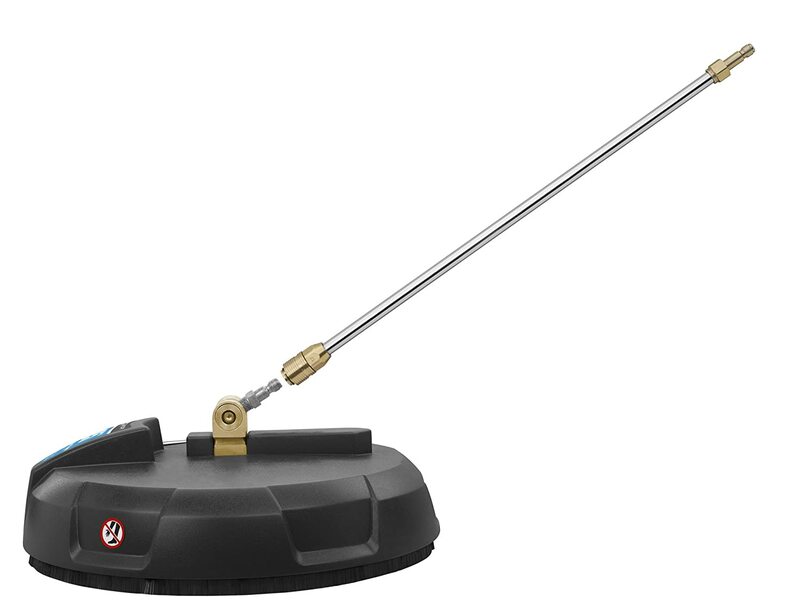 There is a long stick that is attached to move the surface cleaner over a flat surface. The pressurized water hits the tough dirt and cleans them. Because of the spinning swivel, the tool covers a wide area at a time. This is how a pressure washer surface cleaner work. How to Use a Surface Cleaner? Using a surface cleaner is quite easy and it is more effective also. First, you have to connect the spray wand with the connector of your tool. Nowadays most of the surface cleaners use easy connector so that you can easily connect it with your wand. Check if the swivel is working properly because without the spinning the cleaning will not be effective. Hold your spray gun tight so that it doesn’t slip from your hand which might be harmful. Place the tool over a dirty surface and start spraying the water. Now slowly move your tool from one side to another cleaning every part of your to-be-cleaned area. Some of the surface cleaners have wheels and you have to be careful with these tools because wheels might cause trip you up. At the end, we can say that a surface cleaner is also like any other tool of the pressure washer. If you think it important than it will serve you a lot but if you don’t understand its value your working speed will remain the same as before. In this article, we tried to provide you a complete guideline that will help you understand all about a surface cleaner. The individual pressure washer surface cleaner reviews are taken from among the top listed tools. Your work will be at least 5 times faster than a surface cleaner which will save your valuable time. While choosing this tool, try to follow the above procedure so that you don’t fall into any trouble. Your success is our achievement.